Firstly, add 100 grams of cashew nuts into a bowl or jug and soak with water for 30 minutes. Meanwhile, add your green lentils and brown rice to a pan of boiling water. Make sure you’ve bought dried green lentils that do not require soaking before cooking. After 20 minutes of cooking your lentils and rice, wash and drain your asparagus and broccoli. Cut into 1cm pieces and add to your boiling pan of rice and lentils. Cook everything out for a further 10 minutes. Whilst you’re waiting for your pan ingredients to cook out, chop 2 large chestnut mushrooms into thin slices and cook in a frying pan on a high heat using olive oil, until you get a golden charred colour. Once everything is cooked, drain your ingredients and wash away the starch with boiling water. Set aside for a minute and then drain your soaked cashews. Once the cashews have been drained add them to a bowl along with 2 tablespoons of olive oil, 1 teaspoon of black pepper, and 2 crushed garlic cloves. Blend them with a hand blender, adding water a little bit at a time until you get a nice creamy consistency. 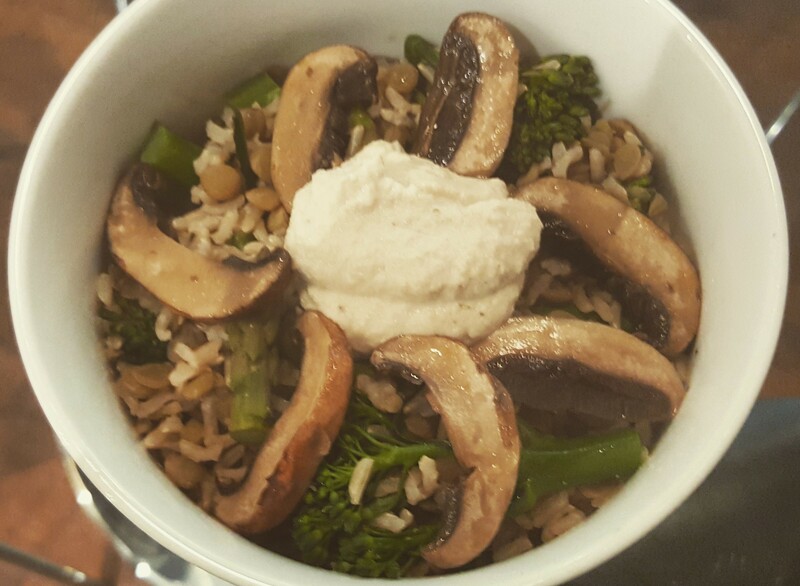 To serve, put your rice, lentils, asparagus and broccoli into a bowl, top with your fried chestnut mushrooms and a dollop of cashew cream. Enjoy!